WE ACCEPT SERVICE ALL OVER IN MANILA, METRO MANILA AND PROVINCES. ACCEPTS SERVICES FOR ALL KINDS OF RESIDENTIAL, COMMERCIAL, AND INDUSTRIAL ESTABLISHMENTS. 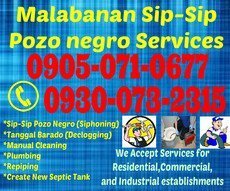 *Garbage removal And Cleaning inside septic vaults. *Installation and constructing of new septic vault. *Locate, open and Repair septic vault. ALABANG, ANTIPOLO, CALOOCAN, LAS PINAS, MAKATI, MALABON, MANDALUYONG, MANILA, MARIKINA, MUNTINLUPA, PARAÑAQUE, PASAY, PASIG, QUEZON CITY SAN JUAN, TAGUIG, VALENZUELA. ALBAY, BAGUIO, BATAAN, BATANGAS, BOHOL, BULACAN, CAINTA, CAGAYAN, CAVITE, LA UNION, LAGUNA, LEYTE, PAMPANGA, RIZAL, SAMAR, SURIGAO, TARLAC, TAGAYTAY, ZAMBALES. Bulacan State University - Main Campus: Courses offered, Tuition fees, Testimonials of graduates, Board exam performance, Contact information and more. My Cash: Quick and Easy Loan Service in the Metro Manila, Cavite, Bulacan, Rizal, and Laguna. The Filipino's First Choice for Quick Loans. The GK Enchanted Farm is Gawad Kalinga’s platform to raise social entrepreneurs, help our local farmers and create wealth in the countryside. REQUEST TO REMOVEBranch Location - Wilcon Depot Inc. Locate the Globe Store nearest you to apply for a Postpaid Plan, settle your accounts, and more!